The new year is almost a month old and this past weekend many motorsports photographers got there first taste of action in 2008 in the form of the Rolex 24 Hours of Daytona Grand American Rolex Series Sports car race. As annual ice-breakers go, this one is particularly grueling. As the series photographer for Grand American Road Racing, this assignment comes about as close to being overwhelming as I'd ever like to get! The car sand teams arrive on Wednesday, I get my cameras and begin to document the new cars and drivers in their new uniforms for the coming season. It's also a good time to roam the paddock and shoot the crews working on the race cars. I also grab a copy of the press conference schedule for the weekend, so that I can fit any important series or team announcements into my shooting schedule. Once I feel that I've gotten the cars from enough differnerent angles, it's off to the pits and paddock to try and photograph as many drivers as possible. It's quite a juggling act, and if you spend your time shooting race cars, someone invariably needs a photograph of a driver and vice-versa. After the Thursday morning practice sessions, ther are four separate qualifying sessions: Rolex GT cars, Rolex Daytona Prototypes, Koni ST cars and Koni GS cars. Since these sessions are only 15 minutes each and since I've already got shots of all the cars from the practice sessions, I usually hang out in the pits to get a few more driver portraits and capture any celebratory shots of the pole winners. Also have to shoot the pole award presentations for the series. There is short dinner break at this time that I use to upload some photo galleries to the Grand Am site from the day's action. After dinner there is a evening practice session that runs til 9pm, after which I catch up on any photos that I might have to upload or e-mail to media outlets. I "sleep in" on Friday , not arriving at the track until about 8:30 for the day's activities. Friday morning begins to get a little insane, as I'm shooting a Koni team photo early, then shadowing a group of foreign journalists as they cover the event. At 10:45 there is a "Champion's Photo Shoot" and media availability in Victory Lane for many of the higher profile drivers competing in the Rolex 24. Immediately after that comes the Koni Series drivers' autograph session, followed by a lunch break filled with press conferences and media anouncements. At 2:15 the green flag waves to start the 3 hour Koni Challenge race. I make my way by scooter to the various trackside shooting locations, photograph some pit stops and wind up in Victory Lane to shoot the podium activities. I dash from Victory Lane, burn a quick CD of photos for on media member, post a Koni Race Gallery on the Grand Am site, as well as a Rolex Media day gallery and some hi-res media photos. Then it's on with dress pants and a jacket and off to the Grand Marshall's dinner where the legendary Dan Gurney, who is this year's Grand Marshall, is honored and interviewed in front of a group of VIP's. I'm home by 10:30. Saturday dawns and I'm at the track early for race day. In the morning I go to the driver's meeting to photograph Race Director Mark Raffauf as he lays down the law to a bleacher full of anxious drivers. Dan Gurney gives a brief talk and Rolex President Allen Brill addresses the gathering. The meeting breaks up and the drivers report to their autograph session where a huge throng of fnas descends upon them making for some spectacular crowd shots that the series loves! Next on the agenda is that annual exercise in futility know as the team grid shots, where we photographers try and shoot each team and car before they are rolled down the grid to line up for the start. Five minutes before the procession was to begin track officals, Rolex series officials and a group of photographers were still trying to figure out how we would accomplish the task. 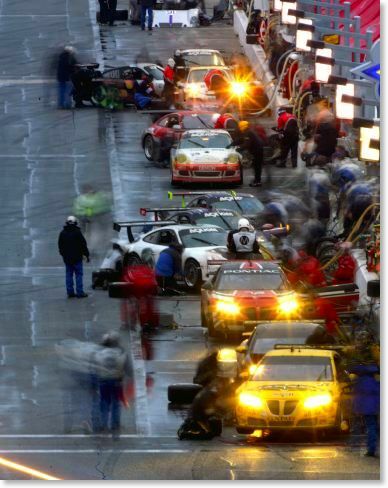 To furhter complicate matters, threatening weather delayed some of the teams from coming out to the top of the grid. We put up a gallant effort and did manage to get all the prototype teams photographed before the series officials aborted the operation and told the teams to just go directly to there grid spots and forego the team photo. It was a good call, as I don't think we could have finished the task before the scheduled starting time. I ran to my scooter and headed out to shoot the first of many "signature" shots that I like to capture each year in the course of the event. There is a spot in the grandstands where you can look straight down pit road and the crowd of fans engulfs the race cars. It's great Chamber of Commerce type shot that I try to get every year. After that its off to the flagstand for the start then to a succession of photo spots til sunset. I also did my annual ferris wheel ride to get some overhead shots of the infield. This was about the 4th year in a row where there actually was no sunset due to heavy overcast. As darkness fell on the race, I had to drive to Gene's Steakhouse, just west of the speedway to take a few photos at a sponsor's dinner. After that I met a few fellow photographers at the Daytona Ale House for dinner and a beer, than back to the track to shoot some night action. After I'd had my fill of shooting, and before I got too tired to do it, I had to post some race photos on the web site, and then I unrolled my sleeping bag in my photo room ini the media center and, for the first time in years, spent the night at the track. After a few hours of sleep I awoke and headed out into the drizzling rain to shoot the sunrise. Again the weather prevented there from being anything resembling a true sunrise, so I decided to head up into the grandstands to shoot some predawn time exposures (see photo above) and slow shutter speed pans. I posted another photo gallery of early morning shots and then set about my annual routine of shooting the a variety of pictures of the class leaders in action as the race began to wind down. A trip to the pits for a few more pit stop shots and then back to my computer where I sent photos of the race leaders to the web sites I was servicing so they could have them queued up for posting as soon as the raced ended. After that it was just a matter of getting to Victory Lane to shoot the celebrations followed by several more hours of computer work. Once again, at the conclusion of the 24Hour race I was amazed at how quickly it seemed to fly by and how, as usual, there hadn't seemed to be enough time to get everything done. Still I sat there staring at more than 8,000 pictures that had to now be edited and organized. As I write this on Thursday evening I'm just burning the last of the DVD's and about ready to wrap up another year of Rolex 24 Hours at Daytona coverage and I wonder if heading into next year' srace I'll be any better prepared. I somehow doubt it. I was covering a pro-am motorcycle event at Daytona International Speedway many years ago. Stationed out at the chicane, which is a pretty remote location on Daytona's road course, out of sight of the spectators and kind of a pain to get to for photographer, I was the only person in the area, other than a few corner workers out at their station. 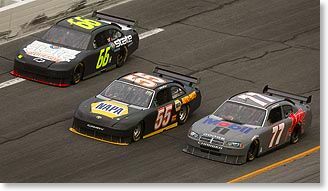 These events were a day-long succession of short sprint races filled with club racers who were not well known and whose skills were not on a level with the great racers who compete annually in the Daytona 200, so the racing wasn't always stellar. These circumstances can combine to lull a photographer into a trance-like hypnotic state. It was in just such a stupor that I sat as I waited for the start of the next race. At these races, the riders circle the track once in there "sighting" or warm-up lap before returning to pit road the line up and start the race. I watch as the group of riders approached my position on their warmup lap. Suddenly one bike slowed to a stop at the entrance to the chicane. The rider got off and leaned his motorcycle against the wall. Thinking that he must have some sort of mechanical problem, I was hoping that this would not delay the start of the race by too much. 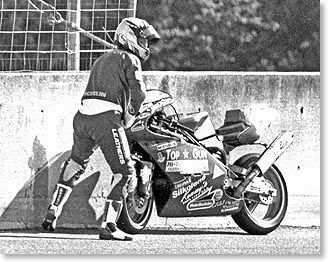 Then, I watched in interest as the rider turned to the wall and appeared to be unzipping his leathers. With his back to me, I watched as a stream of liquid appeared on the wall and ran down onto the racetrack (see photo above). Relieved, the rider re-zipped his suit, climbed back onto his bike and sped off to join the other riders on the grid for the start of the race. I looked around the remote location and realized that I was the only witness to the unusual pit stop. I laughed to myself. My amusement turned to amazement as the same recently relieved motorcycle rider smoked the field and won the race going away! Some people jokingly say that you should always bet on the dog in a dog race who relieves himself on the way to the starting gate, as that dog will be just a little bit lighter, and I guess the same theory must apply to motorcycle racing. Testing . . .testing . . .
For the working freelancer who covers big-time motorsports for a living, the off-season is not much of a vacation. You'd think that the time between the final checkered flag of the fall and the first green flag of the new season would be a time a sitting around the house watching TV with the kids and catching up on domestic chores. More and more, this is not the case. First of all there's annual tour of the awards banquets. In 2007 I covered the following banquets: Grand American Road Racing Rolex Series (Las Vegas, September), Grand American Koni Challenge Series (Las Vegas, November) NASCAR Craftsman Truck Series (Hollywood, FL, November), NASCAR Busch Series (Orlando, December) and NASCAR Nextel Cup Series (New York City, December). So, after all of that, after my tuxedo was hung up for the winter and I gave up my standing spot in the long term parking lot at the airport in anticipation of a leisurely off-season, here came the annual parade of primer painted race cars into town for the ritual of winter testing. Fortunately, this testing all takes place in Daytona Beach, where I live, so the assignments aren't as grueling as the year-long grind of chasing the racers from track to track. Still, as many race fans know, the drivers don't really look forward to these test session, which involve endless laps around the track punctuated by periods of standing around as crewmen work on the race cars, with very little excitement involved. It's not much better for the media and photographers, as the cars aren't painted, the driver's uniforms aren't updated for the new year, and the photos are of little use to anyone, other than just documentation of the test sessions for the track and teams. First, in December, the prototype and GT sports cars of the Grand American Road Racing Series rolled into town for the first of their 2 test sessions. I work as the series photographer for Grand Am, so I'm required to be there. It's a fun assignment and a chance to see my friends in the series in a less stressful setting than the usual race weekend. It's also a chance to see the new teams and cars in their first warmup for the season opening Rolex 24 at Daytona, which runs in late January. The ARCA cars roll into Daytona for their annual pre-Christmas test, followed by a few actual days off for Christmas and New Years. On January 4 of this year, the Grand Am cars returned to Daytona for their final test before the Rolex, now just 3 weeks away. After that there is a string of NASCAR tests, each 3 days long: The first group of NASCAR Sprint Cup cars goes first, then comes the NASCAR Craftsman Truck Series followed by the second group of Sprint Cup cars(the above photo shows the cars of Scott Riggs, 66, Michael Waltrip, 55, and Sam Hornish, 77 in action at this test session) and finally the NASCAR Nationwide Series. As that session ends, I'll finally settle to the couch to really get into the off-season and then I'll realize that the Grand Am cars are just 3 days away from rolling into town for the following weekend's Rolex 24 Hour race. Oh well, here we go again. Maybe I'll have time to catch my breath next December! It's official. I recently to turned 50 and I was 25 when I got my A.S. degree in photography from Daytona Beach Community College. I've been making a living in photography ever since then, so then next time I think "Damn, it seems like I spend half my life lugging these cameras around", I actually have spent half my life lugging these cameras around. Well, not these particular cameras, but cameras in general. To start with, back in the day, we had to carry around a large supply of film and fumble with the camera after every 36 exposures whether it was freezing cold out, pouring rain, blowing dust or whatever. Today we can shoot hundreds or even thousands of pictures without opening the camera, depending on the photo resolution and memory card size. In the old days when the shooting was done, you usually found yourself elbow deep in chemicals, breathing fixer, fumbling in the dark to actually see the results of your efforts. Nowadays the day ends hunched over a laptop computer with cramping hands as you try to stay a step ahead of editors and clients anxiously awaiting your photos. If you want to see any particular photograph, just glance at the back of your camera seconds after you've taken it. Years ago we'd be frantically twisting the focus ring on our lens back and forth trying to keep a moving subject in focus, while today we are often just as frantically mashing a button on our camera and cursing the autofocus system for being too slow. If you are familiar with wire service work you might remember the days when sending a photo over the wire was similar to a kindergarten art class project involving scissors, tape, and glue. You'd "soup" your film, make a print, bang out a caption on a Brother typewriter, paste it to the print and clamp the whole creation to a revolving drum transmitter to send the print over phone lines a picture desk, usually in Washington or New York. An adept photographer today could send a hundred fresh photos via e-mail or FTP in the time it took us to send one picture years ago. I remember thinking that when the digital age arrived, our lives would get easier, but that hasn't been the case. Editors and clients today want more pictures and they want them faster. As technology advances, so does our work load, but, as I like to remind myself, there are worse ways to make a living. Anyway, those are just a few of my memories from the "old days" (which weren't really that long ago) and I welcome and look forward to hearing any of yours!